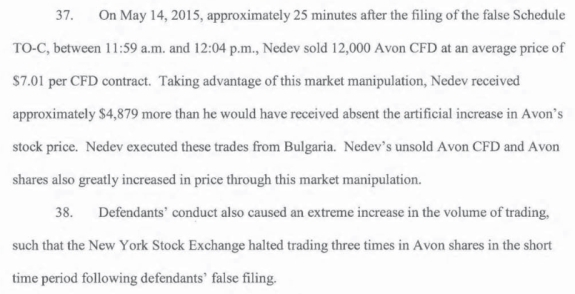 The SEC has gone to federal court in the Southern District of New York, alleging that a Bulgarian is responsible for the manipulation of Avon’s stock price last month though a false filing in the agency’s EDGAR database. Avon, an American network-marketing company famous for cosmetics, was only one of the companies targeted, the SEC said. Bulgaria is a former Soviet bloc country in Southeast Europe. Its capital is Sofia. The incident effectively turned the SEC’s website into a crime scene and led to questions about whether fraudsters were reaching across continents and oceans to carry out their criminal whims in the U.S. marketplace. Named defendants in the SEC’s action are Nedko Nedev, who allegedly used an address in Sofia; Strategic Capital Partners Muster Ltd.; Strategic Wealth Investments Inc.; PTG Capital Partners LTD; and PST Capital Group LTD.
Each of the companies is described in the SEC complaint as highly dubious, with purported bases of operation in places such as London, the British Virgin Islands and Henderson, Nev.
PST “allegedly made a false EDGAR filing in a 2012 scheme involving the stock of Rocky Mountain Chocolate Factory,” the SEC said. “The defendants also are charged with a similar scheme in 2014 involving Tower Group International Ltd., which involved a false press release instead of an EDGAR filing. “The schemes followed similar patterns where the accounts had substantial holdings in a company that had been losing value and the companies’ stock values substantially increased after a false filing or press release originating from Bulgaria,” the agency said. From the SEC’s complaint against Nedev and several purported companies. A federal judge has approved an asset freeze that will protect about $2 million in brokerage accounts, at least one of which has been linked to Nedev, the agency said. Read the complaint against Nedev and the purported companies. Tags: Avon stock manipulation, Daniel M. Hawke, Nedko Nedev, PST Capital Group LTD, PTG Capital Partners LTD, Rocky Mountain Chocolate Factory, SEC, SEC Enforcement Division Market Abuse Unit, Strategic Capital Partners Muster Ltd., Strategic Wealth Investments Inc., Tower Group International Ltd. The U.S. Securities and Exchange Commission announced that on July 7, 2015, a federal court granted in part the SEC’s motion for a preliminary injunction, continued the freeze of over $2 million in assets in brokerage accounts in the name of defendants Strategic Capital Partners Muster Limited and Strategic Wealth Investments, Inc., and extended a previously obtained temporary restraining order against defendant Nedko Nedev.